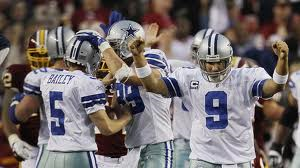 After Week #7 of the NFL, only one team stood alone with six wins: the Dallas Cowboys. Are they for real? Are they that good? Can they really turn their “stuck-in-mud” 8-8 records the last three seasons and really challenge for the Super Bowl this year? If past history is any indicator, the answer is, “Yes.” In fact, as the first team to six wins this season, there is data to support that the Cowboys may be on their way to something special this season. * Two teams lost in the conference championship games, meaning that seven of the 12 make it to their conference title game that season. * The fewest wins of these 12 teams were the Kansas Chiefs last season with 11 wins. Here’s a look at the regular season record and playoff success of those teams that were the first to win six games in a season in the last 10 NFL seasons. Will the Cowboys win more than eight games this season? Will they get back to the playoffs? Could they possibly represent the NFC in the Super Bowl? All good questions. As the first team to six wins this year, things are looking good for a Dallas run late into the 2014 playoffs. Time will tell.